BRIDGTON — The town plans to remove sinks from the Woods Pond beach restroom after sink water failed a bacteria test conducted following reports that beachgoers got sick last week. A spokeswoman from the Maine Department of Health and Human Services said that as of Wednesday, the Maine Center for Disease Control and Prevention had received over 60 reports of illness associated with Woods Pond, and an investigation is ongoing. The beach was back open for swimming Tuesday, but some questions are still floating around after the sink water tested positive for both e. coli and coliform. Town Manager Robert Peabody made the decision to close the beach Friday, July 6, after the CDC notified the town of reports of stomach-related illness from people who had been swimming there between July 2 and July 6. In a press release posted Tuesday, the town announced that the beach was being reopened immediately after water testing conducted by the Paris Utility District found trace, acceptable levels of e. coli bacteria. The release says that the acceptable limit is 235 and the level determined in the test was 3. The town’s announcement also said a water sample taken from the beach’s bathroom sink, which had already been labeled not suitable for drinking, failed a test. The water samples were taken Monday, Peabody said Wednesday, and tested for e. coli and coliform, another bacteria. A copy of the results provided by the town showed 1 e. coli and 41 coliform in the sink water sample, neither of which are acceptable for drinking water. Peabody said that while the sinks were marked as non-drinking and have been shut off, they will now be removed from the roughly 1-year-old bathroom structure as an extra precaution. Despite the test results, questions remain for people who got sick but didn’t use the beach restroom. Bridgton resident Michelle McDougall said her family goes to the Woods Pond beach “all the time,” including three trips last Monday, Tuesday and Wednesday. She and her husband did not get sick, but her 11-year old daughter did, developing stomach problems on Thursday that latest about a day and a half. McDougall’s cousin and her cousin’s three grandchildren also fell ill after joining them at the pond last Tuesday, McDougall said, adding that some used the beach bathroom and some didn’t. “She didn’t use the bathroom at all,” McDougall said about her daughter’s day at the pond. Alanna Doughty, an educator at the Bridgton-based Lakes Environmental Association, said her daughter got sick after being at the pond last Friday, and that her stomach illness lasted less than 24 hours. LEA executive director Colin Holme said the organization has been monitoring Woods Pond for at least 30 years to study long-term water quality trends. The LEA website lists the more than 450-acre water body as a “moderate concern” due to high phosphorus and depleted dissolved oxygen levels. Woods Pond had been listed as a moderate/high concern by the LEA until recently, as phosphorus levels have improved. While Holme emphasized that the LEA was not involved in this most recent Woods Pond testing and does not conduct that sort of bacterial testing, he speculated Monday before the test results were in that the recent issue is “likely related to bacteria” and not related to the the overall, long-term health of the lake. McDougall, who said she and her family spend time at all of the town beaches – which include Highland Lake Beach, Sabbatus Island and Salmon Point – also referenced the large crowd during last week’s heat wave. “I’ve never seen so many people there before,” McDougall said. She thinks the town could have done a better job handling the situation, but said she understand that things like this can happen. Barry DeNofrio, a Woods Pond property owner who has been involved with the Woods Pond Water Quality Association, was confident that the lake community will move past this incident. “It’s a wonderful lake. I’m sure this will pass very quickly,” DeNofrio while standing on the beach Monday morning. While the town does not currently conduct regular water testing at the Woods Pond beach, Peabody said there had already been some discussion about potentially starting some sort of testing regiment. 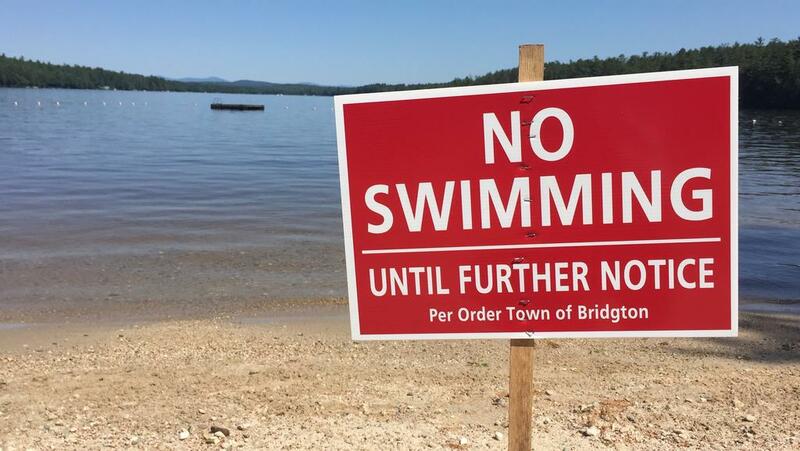 Woods Pond beach in Bridgton has been reopened for swimming, but sink water in the beach’s bathroom has been shut off after failing a test.